In a large Dutch oven, or large heavy skillet with lid, heat oil over medium heat. Stir in ham, sausage and pork; sauté until lightly browned, stirring frequently, about 7-8 minutes. Stir in onion, celery and pepper, sauté until crisp-tender, about 4 minutes. Stir in garlic, hot pepper sauce, bay leaves, salt, oregano, white pepper, black pepper, and thyme; cook over medium heat, stirring constantly and scraping bottom of pan for 5 minutes. Stir in tomatoes, tomato sauce and chicken broth; bring to a boil; stir in green onions and rice. Cover and bake until rice is tender, about 20-25 minutes. 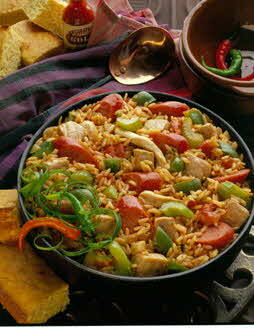 Some think of jambalaya as the Cajun national dish. Others just call it darned good and an easy way to feed a crowd. It does feature the Cajun “culinary trinity” of celery, onion and green pepper; it also features flavorful smoked pork products that help give it its character. This rice-based one-pot meal needs only bread as a “pusher.” Bon appetit!